Green Man Cider is Ben Totterdell and Simon Houghton. 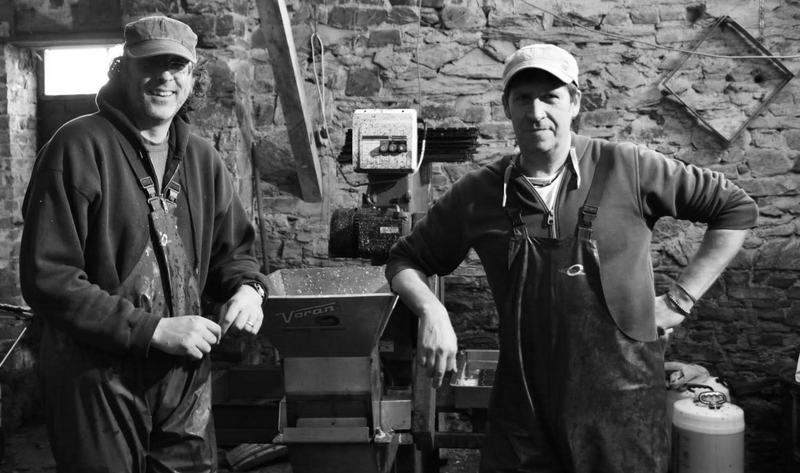 We have been making proper cider in North Devon for years, though until recently only for ourselves and friends . In 2014 a small local cidermaker retired and we were presented with the opportunity to buy his excellent equipment. Having bought it we thought we better make more cider – and so began the Green Man story. Ben was born and grew up in North Curry, Somerset in the apple-scented epicenter of Somerset Ciderland (try saying that after a few); apples, orchards and cider have always been part of things. Simon, although an Essex boy by birth has readily embraced West Country culture including a love of fine cider. We are both passionate about our cider and keen to ensure that the beautiful traditional orchards of Devon and Somerset remain an important part of our landscape, and that cider and cider making remain an expression of West Country culture and heritage.